Let’s face it, what parent hasn’t had a child clamp their mouth tightly closed with face with a spoonful of medicine or bared the brunt of a mouthful being spat out in their direction?! One woman stepped up to this job with some preemptive DIY and a lot of ingenuity. 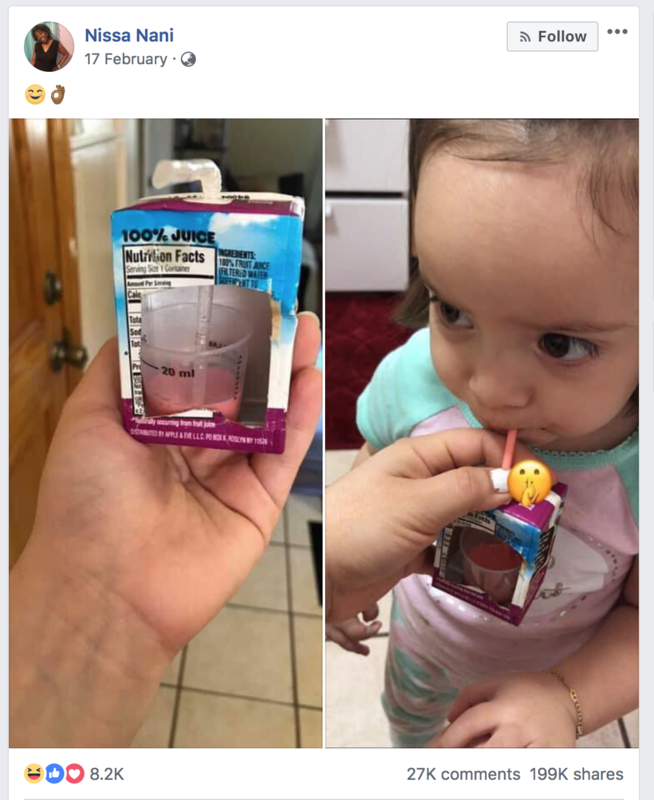 Nissa Nani had sneakily cut the back out of a juice box container, popped a medicine cup inside and held it out to her daughter (at least we think it’s her daughter) to sip on. The little girl is photographed taking a big sip of the ‘juice’ beginning to down the medicine before she knows what’s going on. We’re not quite sure what happened next – whether this little one worked out that this didn’t take like any juice she’d ever had, or simply kept sipping. But we love the clever determination that these photos portray. Other people loved them too, commenting and tagging in their literal tens of thousands. “Game changer,” another commenter posted. “I’ve seen it done with a soda can before this before. Anyway, good idea!” someone else enthused. “Oh, the things you have to do sometimes,” another mum wrote. “Ha, where were you when my kids were little? I will remember this for my next generation!” one granny-to-be commented. Nissa’s post has been shared almost 200,000 times because everyone loves finding genius ways around everyday problems with kids.